Georgetown is a small town in central Texas, just north of Round Rock and about 27 miles from Austin. It is the county seat of Williamson County. The presence of Southwestern University gives the community a college town feel. Many of the students are bikers. 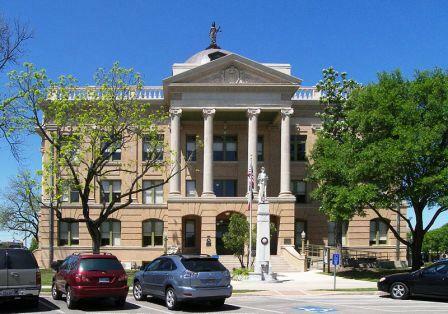 The town has an impressive collection of well preserved Victorian and pre-WW1 downtown historic districts, with The Beaux-Arts Williamson County Courthouse (1911) as its centerpiece. Georgetown has a carefully restored downtown which won a Great American Street Award a few years back. Both tourists and residents alike enjoy more than 200 restored buildings that recall its grand past. The local Inner Space Cavern is popular tourist destination. Crime is extremely low. Image of the courthouse by Larry D. Moore, used under a Creative Commons ShareAlike License. There are active adult communities in the area (see link on left), or you can live in the town. Sun City Texas is the largest of these. There are also some planned communities that are not 55+ restricted, but are popular with active adults. Zillow reported the median home listing price to be $329,900 in early 2018..
Small town charm and many historic neighborhoods. Southwestern University. The San Gabriel River runs through the city, which provides over 30 miles of hike and bike trails, several parks and recreation. From all reports, people are very fond of living in Georgetown. The city has a farmers markets. Texas has no state income tax. Georgetown is a walkable community. It claims it has the most beautiful Town Square in Texas. Hot summers. Real estate prices higher than in much of Texas. Round Rock is north of Austin (27 miles) and Round Rock. The average July high temperature is 96 and the average January low is 35. May is the wettest month with 5" of rain. The Palace Theatre offers a regular schedule of events. There are movies in the Park as well as at a 12 screen theatre. There are numerous festivals throughout the year including the Red Poppy Festival, The Georgetown Sculpture Tour–a rotating exhibit of sculptures on loan from the artists who created them - Art in the Square, and the Christmas Stroll. The Art, Music, and Theater Departments of Southwestern University are a popular resource. It is just a short drive to Austin where the culture is non-stop. The crime rate in Georgetown is very low with an index of 100 vs. the national average over 300. Georgetown Hospital serves the City of Georgetown, more hospitals are in Austin. Georgetown has a municipal airport with air taxi service. Georgetown is a very walkable community.